“Religion that God our Father accepts as pure and faultless is this: to look after orphans and widows in their distress and to keep oneself from being polluted by the world.” (James 1:27) Caring for children with disabilities, I believe, is “religion” that God accepts. 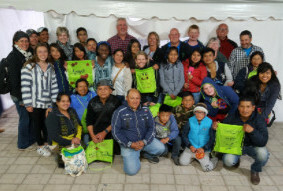 Our work with the Cotinga Foundation is making great strides to minister to not only the children, but their families and especially their educators. 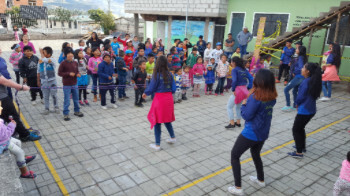 For one week each year, more contacts are made and more progress is achieved at the special school in Cayambe. The ministry also provides us with opportunities to be in contact with many families and professionals who we wish to reach with the Gospel. 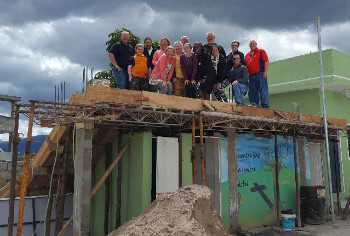 The Genesis Church team came a week after the Cotinga Foundation. They helped our church with several projects around the property. They painted the fence, refinished the main entryway door, and poured a cement slab roof over the bathrooms that will serve as a floor for a new classroom in the future. They worked extremely hard, but had great attitudes and really got to love our people. The best event of the week of the Genesis Church visit was the family conference we held at the church for the community. We had almost 100 men, women, teens and children from the community attend each of the three nights and then the Sunday closing. One of the highlights for us and the team was hearing the testimonies of the people who attended the adult conference. One mother came forward to share how much she had learned and how she recognized hos much of her life had been dedicated to her work and not to her children. She had never come to our church before, but has now attended every Sunday since. The Genesis team left not only a lasting physical work on our church property, but also a lasting spiritual impact in the lives of many families. Our VBS season is already underway. As we send this message out, our VBS team is reaching out to more than 100 children a day. Please pray for our VBS this week and for possibly a second week that we will be doing in a new location. Pray that we can reach not only the children, but that we can reach parents and families for the Gospel of Christ this week and throughout the summer vacation time. Especially remember the young people who are teaching and leading throughout the sessions of VBS. In between the Cotinga Foundation and the Genesis Church team, we were able to take a few days to spend time with visiting family. Dave’s parents and his cousins were part of both teams. 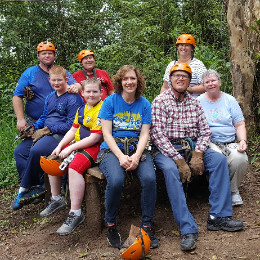 The picture above is from one of our adventures on zip-lines through the Mindo cloud forest.In between the Cotinga Foundation and the Genesis Church team, we were able to take a few days to spend time with visiting family. Dave’s parents and his cousins were part of both teams. The picture above is from one of our adventures on zip-lines through the Mindo cloud forest. The Genesis Church team was invited to join us during their first Sunday with as we celebrated the baptism of 7 girls from our youth group. Each one of these girls has a wonderful story of how God’s grace reached their lives through faith in Christ. Of the 7, 5 of the girls come from non-Christian families. Several of them are the only believers in their household. Please uphold these new believers in your prayers. Pray for their persistence in the faith and for opportunities for these girls to reach their families for Christ.